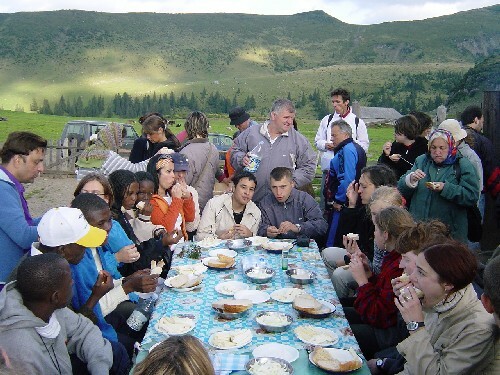 the International Conference on “SOUL EDUCATION” held in Findhorn, Scottland in October 2000 with all the meetings that followed including the last one in Budapest, Hungary, October 2004 <trianglesineducation@virgin.net>. the constitution of the “YOUNG GENERAL ASSEMBLY” <http://young-GA.org> . 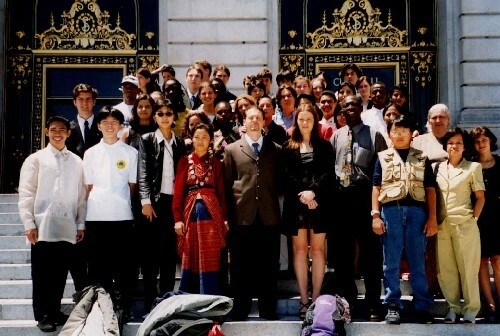 The 1st YGA was held in 2000 in Pomona, USA <peaceways@igc.org> secretariat. N.B. In 2004 ICPC ITALIA sent two Italian delegates to the 4th YGA in Romania. at local level increasing interest in education for sustainable development and the spreading of Fair Trade shops. UNICEF Italy has increased peace oriented projects adressing local school children. teachers: teaching is getting more and more difficult; lack of time as teachers are fully engaged in official school programme, amministration formalities, psicological difficulties of the children etc. Almost no dialogue with the childrens and students in the classrooms. youth: very little interest towards learning being absorbed in mass media influence. During 2003 the ICPC’s first book has been created in cooperation between adults and youth. 239 pages, left side Italian, right side English; 365 questions to be answered in self-analysis. ICPC ITALIA on request can send the whole English version (Acrobat Reader) as an e-mail attachment. Over 200 books have been sent to the ICPC Italy’s contacts worldwide. The translation into Russian is already available, by merit of a Russian teacher, on <www.rawe.ru>. 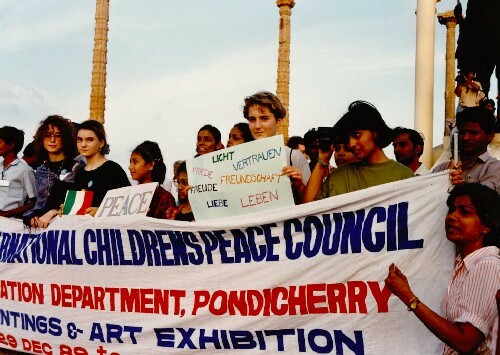 ICPC Italy’s Self-peace-education Project “Eight Steps towards Peace” (ESP), inspired by Robert Muller’s Core Curriculum (title of the book: “New Genesis”, Doubleday, March 1984) was launched in 1990. Since 2000 this project is spreading more and more. It has been applied in many classes in Kindergarten, primary and secondary schools, in different regions of Italy (mainly in Northern Italy but also Rome, Ligury). It has always produced greater harmony in the classroom.Teachers are invited to go through the whole process by themselves before they bring it to the children. I ask myself: “Have I looked sincerely at my attitudes towards all human beings? Has my new awareness of us being all “souls” and “citizens of the Planet” helped me to open up towards the “others” and therefore send thoughts of understanding and will for good to everybody? In which situations have I succeeded and where can I still improve?” ICPC shall be happy to receive whatever you like to share with the companions on this journey. ** What characteristics of my personality and what specific talents positively influence life and activities where I work? ** Which are my defaults in my relationships with others and how deeply am I ready to transform them? - co-operating with all the others, in a group, respecting everybody’s creativity. ** What values, qualities, capacities do I recognise in others ? ** What particular relation do I want to improve during this month? Every day I commit myself to listen carefully to all signs life offers me in order to make my relations at work more creative and co-operative. I will therefore support, through my thoughts, words and actions, the creation of a world of Peace. The ICPC projects, materials and ideas are deeply appreciated and used at the school “Figlie del Sacro Cuore” in Bergamo, in the North of Italy. This school includes a nursery, primary and secondary school (ages 3-14) and has a specific “Peace Education Project” covering all classes both in primary and in secondary school. The ICPC Self-Peace-Education project “Eight Steps towards Peace” (ESP) is actually the basis/skeleton for all primary school classes peace education project. -	Grades 4-5 – relating to others far from us (all human beings, our planet, the universe). The various topics are dealt with by all of the teachers working in each team as a cross-curricular activity throughout the five years of primary school. The focus is always that of starting to find peace and understanding of reality within ourselves in order to improve the outside world. The complete ESP has also been used in some classes during the same school year (all 8 petals in eight months) in so considered “difficult classes” and in an optional workshop in grade 2. The sentence at the centre of the Symbol: “I have the power to do my best to create a world of Peace inside and around me” is also used by some teachers as a “magic formula”, repeated three times at the beginning of each lesson, especially with young children in grades 2-3. Two teachers in the school whom regularly practice meditation also work on a soul-contact with students (with “difficult students” in particular), with parents and colleagues. Finally, the ICPC Promise “As a child of the Universe I promise ….” has been used both in the form of the original promise for the first day of the new year (together with the candle) and also in the form of a blessing as a school gift for children’s First Communion. April 2005 Fiona Mancuso English teacher at primary and secondary school classes. “We the Peoples Initiative” <http://wethepeoples.org> <http://www.pathwaystopeace.org>. only YGA’s associated member of Western Europe so far. PROJECT NUMBER 6 (year 2000). students con learn more effectively and be better prepared for present day life. available to educational policy makers all over the world. other appropriate individuals anywhere in the world. examine possibility of co-coperation with UNESCO for this purpose.